If your pet is experiencing an abnormal rate of sneezing, nasal discharge, and bad breath, he/she might have this condition. It is an abnormal opening between the oral and nasal cavity. Usually occurs after an infection of or loss of a tooth (most commonly canine tooth). May cause chronic nasal infections. Oronasal fistula at the previous upper canine site. 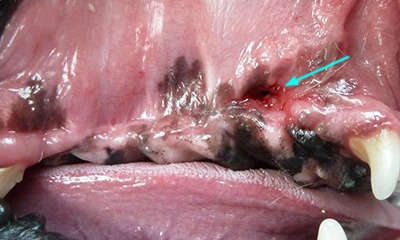 Surgical flap used to close the site with absorbable sutures. Schedule an appointment today to have your pet evaluated for oronasal fistula. An oronasal fistula is an opening or communication between the oral and nasal cavity. This occurs secondary to periodontal disease or loss of any maxillary (upper) tooth, most commonly the canine tooth. Signs of this condition include sneezing, nasal discharge, and bad breath odor. 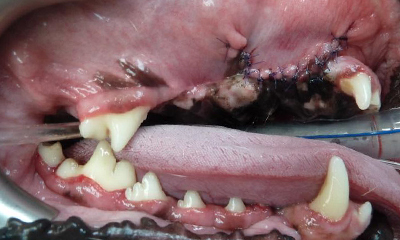 Oronasal fistula needs to be evaluated with dental X-rays for impacted tooth/root structures. Surgical repair is accomplished with a gingival flap, debridement of the site, preservation of blood supply to the flap and tension-free closure of the site for good healing.